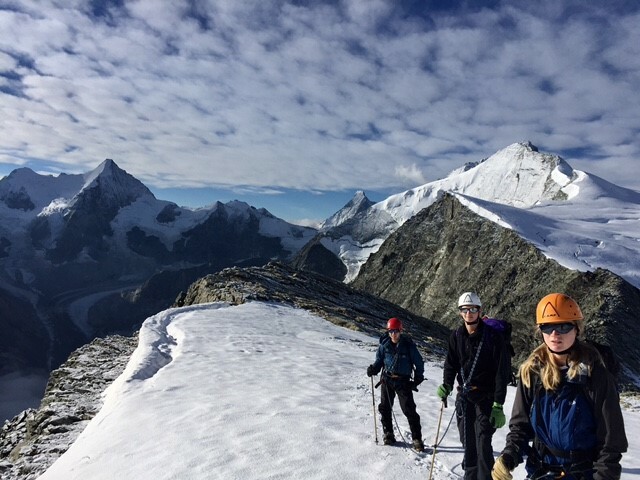 The aim of the expedition was to introduce Officer Cadets to Alpine mountaineering, including teaching them crevasse rescue techniques and skills for moving on a glacier using ice axe and crampons, and to give them experience of summiting an Alpine peak. There were 11 military participants and one civilian International Federation of Mountain Guides Association guide. Of the military participants, eight were Officer Cadets and three were instructors (including the expedition leader, Captain Amanda Washbrook R SIGNALS and the expedition second-in-command, Officer Cadet North). We chose an area with sub-4000m, accessible Alpine peaks that offer good introductory opportunities for participants. 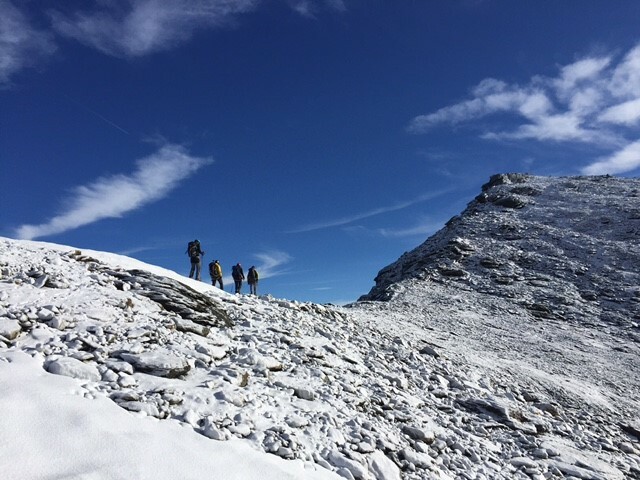 We feel this was a sound decision as it ensured those who acclimatised less quickly or were less fit or surefooted were able to participate in challenging training above the snowline which did not over-face them. Selection weekends were held in the Brecon Beacons and Snowdonia in Spring 2017. This training was helpful to assess individuals’ fitness and robustness (including sure-footedness), and also their response to discomfort due to very poor weather before selecting participants for the expedition proper. Pre-training in first aid was delivered to participants two weeks prior to departure by a Unit instructor. Pre-training was also delivered in rope skills and climbing. This took place during a drill night and a training weekend in the Peak District prior to the expedition. It was useful for participants to practise simple skills such as tying-in and putting on harnesses in a real environment so that this was not new to them in the Alps. It was also a good opportunity for participants to receive a detailed brief on the expedition, be shown how to pack their rucksacks, and start to get to know each other. Funding from the Ulysses Trust enabled this expedition to take place and we are very grateful for this support. Below is a daily diary of the expedition, which illustrates the activities that took place and includes accounts from Officer Cadets (OCdts) of their experiences. OCdts and instructors paraded for kit and document checks and briefings, and an early night. A very early start to drive to Folkestone and take the Eurotunnel to Calais. We drove through France and into Switzerland, and spent the night at Camping Les Rocailles near Champex. The group decided to eat in one of the small restaurants in Champex. Having slept well after a full day of travelling, we were all ready to embark on the ascent up to the mountain hut – Caban d’Orny. 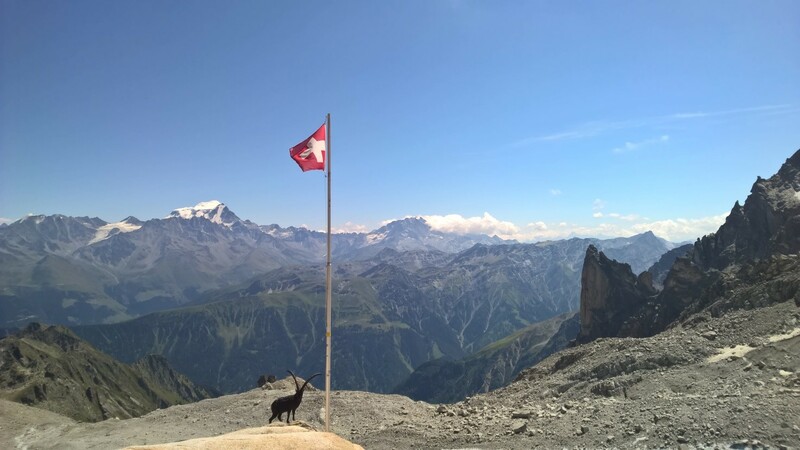 This involved taking a cable car up for roughly 500m, and then a further four-hour walk up to the hut, during which we were spoilt by the breath-taking views and scenery of the Swiss Alps. The mountain hut itself had a simple and rustic feel, and we quickly made ourselves at home by packing our kit away and getting on our Crocs. In the evening we were also greeted by our Mountaineering Instructor – Stu McAleese – who introduced himself and gave us a brief of the training for the next day. With a long day ahead, we all turned in for an early night. After a 4am start, the team of six OCdts and two mountain instructors set out for our first ecôle de glace and possible summit attempt. Soon after leaving the mountain hut we arrived at the glacier leading up the mountain. This was our first experience of using crampons and tying together in files of four. Clumsily at first, we set out up the glacier focusing on every step we took. It soon became apparent that the danger of crevasses was very real, with parts of the glacier deeply scarred in several places. Unfazed, our mountain guides taught us the drills to carry out in case of a fall and led us over the crevasses with ease. 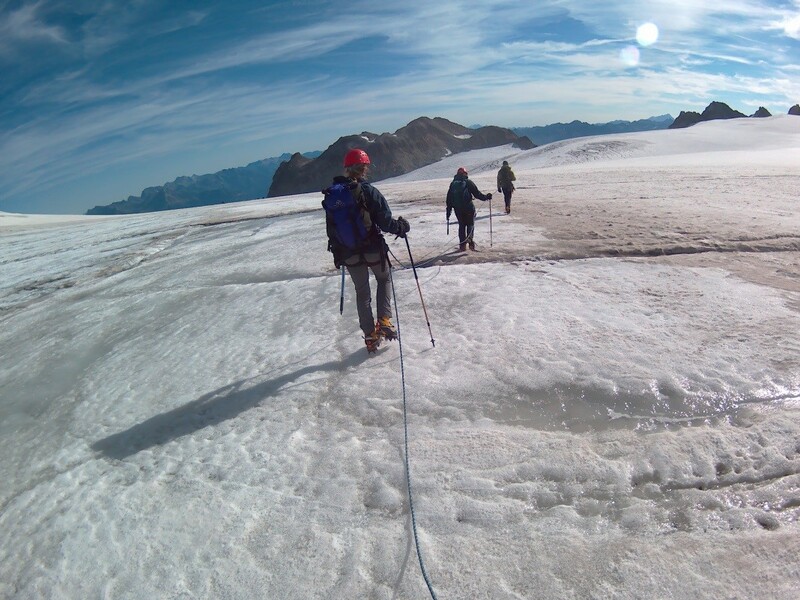 As we approached the peak we realised that with the heat of the sun meant if we did not begin our descent soon the ice would start to melt, meaning our crampons would be less secure. It was decided that the safest option was for us to stop about 300m to the left of the summit, which would have been time consuming to ascend given its gradient. Nonetheless, the view was spectacular, with us able to see down the valley into France and also catch a glimpse of the top of Mont Blanc. After some lunch, we descended back towards the mountain hut. Just before finishing for the day, we did some further practice of crevasse rescue drills, including how to construct a pulley rescue system using either ice screws or an ice axe dug into the ground. With high spirits, we returned to the hut where we met the other OCdts who had enjoyed a day’s rock climbing, to share our stories from the day over some well-deserved brews. We awoke to torrential rain as we prepared to walk down the mountain today. Having not seen much of the surroundings on our way up to Caban d’Orny a few days prior, we didn’t see much more on the way down… except perhaps more rain. We did, however, spot a Chamois which excited James so much he dropped his pole! Drenched and cold at the foot of the mountain, we jumped into the combivan to drive to Moiry Glacier two hours further East. Despite promises that the weather is usually better in this area, the ascent to Caban de Moiry was not dissimilar to the training hike in Snowdonia in March, as Duncan repeatedly pointed out. But as we rounded the corner to our destination, the view from the Caban reminded us we were somewhere far cooler. After a long, wet day the view of the seracs and the glacier below was breath-taking and well worth the hike! Plus the mac’n’cheese dinner was blissful. While the other team went and trained above the snowline, learning Alpine skills and summiting the Pigne de la Le, three of us remained in the mountain hut for a lesson on rope work with CSM Sauvary. We practised knot-tying set-ups for a variety of situations such as top rope climbing as well as scrambling. We were lucky enough to be outside the mountain hut doing this when the resupply helicopter came up, which was an interesting insight into life in the mountains. Later in the day, once the others had returned, we went out for a climbing/scrambling lesson where we got to put some of the knot and rope skills we had learnt that morning into practice. Because of very poor weather, the group walked down from the Caban de Moiry, to strike camp for the night at Camping Les Marmottes, and we said goodbye to our IFMGA guide Stu. On Friday we were still disappointed that we weren’t up in the mountains, however we could still enjoy the beautiful scenery. We had all decided to go to the rock and alpinism museum to learn some more about the landscape that we had spent time in and the background of climbing and mountaineering. This was a very useful and fascinating trip and allowed us to understand a lot of what we had seen during the trip. We then had the opportunity to explore the town and take in the local culture. Then we continued on to the local kit and equipment store where we were able to see what is available on the market for mountaineering, climbing and various other outdoor sports. Being the last evening, we had the chance to reflect on the trip and discuss potential future plans to continue developing the skills that we had learnt. The drive back through France to take the Eurotunnel back to the UK. We arrived back at the OTC and got our heads down!